What good is a junior ski without a junior binding? The Z02 Junior from Hagan has a DIN settings that range from 2 to 7, perfect for those budding backcountry skiers and future skimo racers. Don’t make your kids suffer with heavier bindings while you waltz uphill on lighter kit. Thank you Hagan for freeing our kids from the resort boundaries. Now we just need avalanche awareness taught in elementary schools. Step in toe piece and heel is familiar for kids used to alpine bindings. Four riser heights lets kids pick from 0°, 5°, 10°, and 15° angles. Double force retention and TÜV certified for release. 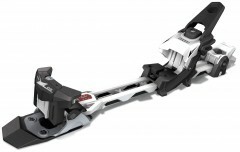 Compatible with downhill and alpine touring boots. Comes with a ski leash, brakes are available. Note: These bindings are only compatible with junior (not kids) boots. The sole lugs must be the same size as adult boots, not the narrower and thinner ones found in kids boots. These bindings are ok, but be aware that in slush/spring snow/sierra cement, they ice up something wonderful. The way the front of the binding pivots, it tends to compress snow under the binding, making things worse. The old Silvertta Pure Kidz binding was far better -- cleared the snow out beautifully. Still, our kids got a few good years out of them, using downhill boots, before they grew into modern bindings (i.e. Dynafit tech-type). So overall, worth it. Hi Karen, the will work great for her then. The sizing is based off her boot size. If her current boots are at least 255mm long, she can go with the Small to give her more room for foot growth (vs the X-Small).